The 88th skeptic carnival us up at Jyunri Kankei's matters of reason. This is a belated post, as I was in the field when it came out. And I'm in the field again. But I’m sure the material only improves with age. There was an article in the Australian newspaper today about a recent settlement between a NY hedge fund and the Republic of Congo (not to be confused with the Democratic Republic of Congo, which is the former Zaire). Elliot management, a $10 billion dollar hedge fund, acquired 0.1 billion dollars of overdue debt from the RoC, one of the most impoverished companies on Earth. The reason this deal was not complete lunacy was geological- the RoC is Africa’s 4th largest oil producer, and with today’s record prices, their production is worth almost 12 billion dollars a year- allowing the country to pump Elliot’s net worth every 10 months. The problem was figuring out where all this money went. Their first step was to get court injunctions allowing them to have assets seized to pay off this debt. This move was strongly condemned by the millionaire poverty activists like Bob Geldorff and Bono as perpetuating the cycle of African poverty. Ignoring these taunts, they then proceeded to do, using private investigators and their own money, what law enforcement agencies have been unwilling or unable to do for decades- they started tracking down the byzantine pathways by which the African oil was delivered to markets, and the financial conduits through which the money flowed. Where evidence of corrupt or illegal activity surfaced, they pressed for racketeering charges. And in a final act, they acquired and then published the credit card receipts of the president’s son, showing that he ran up a quarter of a million dollars in designer shopping bills in Paris while he people were struggling on a few dollars a day. The end result is that the RoC decided that paying back debt might not be so impossible after all, in exchange for the cessation of the investigation. While this action does not have any direct impact on the plight of the country, there are substantial indirect benefits. By actually paying its debts, the RoC becomes a marginally less dodgy credit risk for future loans. More importantly, it puts the people in charge on notice that using oil and aid revenues for personal enrichment is not a risk-free strategy. Debt forgiveness would have accomplished neither of these things. So I’m chalking this one up as a victory for the forces of quantification and data collection over those of emotion and ideology. Vultures 1, Activists zero. And minus $100,000,000 for the dictators, their money launderers, and associated forces of evil. The Murcheson meteorite has been in the news again, as a result of a slick piece of organic geochemisty described by the Bad Astronomer. Indeed, from the Wikipedia entry you’d think that this is the meteorite’s only claim to fame. But there is far more to this rock than mere molecules. Murcheson is the first member of the cosmochemical trifecta of 1969 (The others being Allende and the Apollo moon rocks). A primitive chondrite, it is one of the main sources of presolar grains- interstellar dust particles that predate the solar system. Mind you, the meteorite itself is not pre-solar. The vast majority of it consists of material that condnesed from the solar nebula. But this particular meteorite has suffered no remelting since it formed, and as a result, tiny bits of pre-existing dust can be found in it. The most well studied and characterized of these grains are silicon carbide. These grains are rare, and isolating them is a lot like finding a needle in a haystack. Indeed the methodology used to recover them is similar. Carbides are chemically resistant material, so they are isolated by simply dissolving the rest of the meteorite in acids and other solvents. This is the metaphorical equivalent of burning down the haystack and pulling the needle from the ashes with a magnet. These silicon carbide grains have been useful for all sorts of purposes, such as experimental confirmation of stellar nucleosynthesis, chiefly the S process. But these carbides also present a significant sampling bias. Then can only form in carbon stars- start which have more carbon than oxygen in their atmospheres. If there is more oxygen than carbon, then the carbon will be consumed in the production of carbon monoxide, and the leftover oxygen will form metal oxides instead of carbides. So oxygen stars like the sun cannot form carbides unless the C/O ratio changes as a result of helium burning in the star’s dying days. Oxygen stars should be able to form refactory oxides which are tough enough to survive the collapse of the solar nebula. And indeed a few presolar corundums are known. But because rocks are made chiefly of metal oxides, finding presolar oxides is more like finding a pine needle in a haystack. Instead of a match, you need a gaggle of patient grad students. However, such people do exist, and are currently trying to invent efficient methods of finding anomalous grains. Hopefully they will find and characterize extrasolar silicates before too long. I don’t think we’ve heard the last from this rock. In today’s Australian, Paul Kerin launches a devastating attack on the Rudd government’s $70 million dollar handout to Toyota to support the manufacture of Camry hybrids in Melbourne. While hybrid technology generally improves the fuel efficiency of a car, the Camry was a gas guzzler to start with, so the improvements only make it middle of the road. So unlike the fuel efficient Prius, the hybrid Camry will only be the 120th most fuel efficient vehicle on the road. Money that could otherwise go towards developing solar or wind power generation will instead be used to subsidize a car that generates twice the CO2/km than the market leading models. To me, this sounds like yet another example that the Rudd government’s main goal is to use public funds to prop up unionized industries under the justification of climate change action. While not of the magnitude of his carbon sequestration proposals, it is even more blatantly a subsidy for mediocrity, which will make it harder for genuinely innovative and useful technologies to become economically competitive. I’m about to head out bush again, with instructions not to come back until the drill bit pokes through into the new Olympic stadium. * This was supposed to happen 2 weeks ago, but a few inches of rain sent me slithering back to town until the ground dried out enough to get the rig in. So barring any more freak off-season storms, I should be out of touch for a good long while. I’ve programmed the cyberbrain to periodically update the lounge while I’m gone; please play nice with it. Cheers, y’all. * It is a geographic fact that China is on the opposite side of the world to everywhere. Since 1940, because of the great war demand for quartz oscillator-plates in the radio industry, added impetus was given in the United States to the study of quartz and its twinning by the work of Armstrong, Bond, Frondel, Gordon, Hurlbut, Parrish, Stoiber, Willard, and others. No attempt will be made to cite all of the references; some are noted in recent papers by Frondel, Parrish, Hurlbut, Gordon and others. And good on the Mineralogical Society of America for putting old papers like this online for free. Gault, H. R. 1949. The frequency of twin types in quartz crystals. American Mineralogist 34 142-162. One of the biggest differences that I’ve noticed between exploration geologists and academic geologists is their outlook. Many academic geologists, particularly senior ones, seem to be stuck in some sort of low grade malaise. They complain about everything- funding, lack of funding, papers by their competitors, research by their students, admin, technical staff, and even the weather. Some of them will even complain about the quality of free after seminar food, which illustrates just how jaded they’ve become since being students. So one of the things that I love the most about working in exploration is that everyone has a great attitude, and a cheery outlook. On the one hand, it seems odd. Once a professor has tenure, you’d think that they’d run out of things to complain about. After all, they are more or less set that that point. In contrast, less than one in a thousand exploration projects actually finds anything worth mining, and yet the people looking are full of boundless optimism. I wonder if some sort of perverse selection effect is responsible. It is entirely possible that after years of dud targets, false hopes, and disappointing intersections, only those geologists with boundless cheerfulness stay in exploration. In any case, the difference really struck me when I went into university to catch a talk earlier today. He [Holt] recalled his exasperation when anthrax spores were discovered in the Capitol in 2001 and colleagues came to him and said, “You are a scientist, you must know about anthrax,” a subject ordinarily missing from the physics curriculum. “In fact, we basically did that,” Mr. Ehlers said. Among other things, they said, a science adviser should be someone who will remind the next administration what science can and cannot do. I wonder, though, aside from these three are there any other physical scientists in congress? Chemists? Geologists? Most of the other scientifically trained representatives that the article mentions are health-related scientists. Not that there’s anything wrong with keeping people well, it’s just a different field than discovering the laws that govern the inorganic universe. Anyway, the article is worth a read. When science teachers insist on keeping creationism or intelligent design out of their classrooms, they are not asserting that scientific knowledge is superior to religious insight. They are simply insisting that each path to knowledge involves different rules and that those rules are not interchangable. Today’s deskcrop is a dacitic lump of pumice. It isn’t exactly the flashiest rock on the planet, but it is interesting. The reason, of course, is that mainland Australia doesn’t have any dacitic volcanoes. In fact, it hasn’t since rising sea levels opened the Torres Strait and cut off Australia from New Guinea after the LGM. So where does this fresh pumice come from? It is found all up and down the East coast, on the beach, in the storm deposits above the high tide line. To understand how it got there requires knowledge of oceanography. 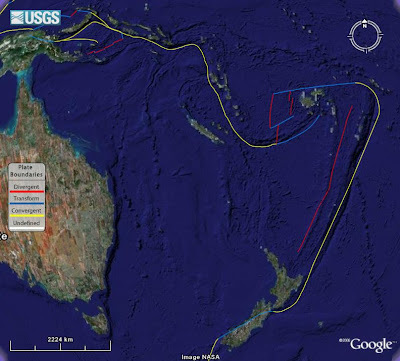 The following image (from csiro) shows the ocean currents around Australia. As it shows, the dominant ocean currents on the East coast of Australia are the East Australian current, which flows south from the Coral Sea. This is a continuation of the South Equatorial current, which flows west across the South Pacific Ocean. Before crossing the Coral Sea, the South Equatorial Current flows through the Solomon Islands, Tonga, Vanuatu, and Fiji, all of which are on convergent margins (see Google Earth pic, below). These provide an ideal environment for arc volcanism- indeed most of these islands are volcanic. Several studies have looked into the origin of this Eastern Australian pumice, and they all point to these volcanic arcs as the source. So even though Australia has no active volcanic arcs, the ocean currents deliver volcanic rocks to our shores- and these volcanic rocks in turn raft nominally sessile creatures across the ocean- note the worm casting that are growing on this sample. In short, sedimentary transport is not confined to continental terrestrial environments- ocean currents can transport lithic material as well. If America is the new India, what is Australia? A while back, a friend of mine in the IT industry learned that a job he was about to start had been downsized before he even began. Evidently the company decided that with the current labor and currency markets it would be cheaper to hire offshore Americans to do the coding. The Australian dollar was at US$0.50 in 2001. Now it is US$0.95. And borrowing money here is also more expensive. As American has been cutting interest rates to fight its liquidity crisis, the Australian fed has been raising them, trying to curb an economy that it considers to be overheating. The Australian economy is being fueled by high world commodity prices, which have created the biggest resource boom in a generation. But as my friend discovered, the rate rises that the fed has instigated aren’t biting the overheated resource industry- they are hitting service and domestic industry jobs, as vastly higher mortgages (US fixed rate mortgages don’t really exist down here- out repayments have doubled in 3 years) cut into homeowner’s disposable income. The obvious problem here is that these rate rises don’t really effect the geoeconomy, as domestic consumer demand is not what drives the resource sector. Demand from Asia does. And as the Australian rates rise, making local money more expensive, mining companies respond by courting overseas investors. Some state (not federal) resource departments have even started Chinese language sections of their web pages to encourage investment. This flow of foreign capital into Australian businesses further increases the value of the Australian dollar, making non-geological exports less competitive. The trouble with this situation is that even in a land as vast as Australia, mineral resources are not infinite. Ideally, non-renewable resources are best used to build a technologically advanced society that can move from extractive-based economies into manufacturing, service, and technology. Unfortunately, the opposite seems to be happening here in Australia. If your main goal is to preserve the good life for heavily unionized extractive industries, then the status quo may seem pretty good at the moment. But cooling the economy by squeezing out the more advanced industries at the expense of mining doesn’t make a whole lot of long term sense.